Plan for an exciting holiday in Morocco, with our array of packages to explore our desert hotel with family or friends. For general inquiries or special groups/agency prices, please use the contact page. If you wish to book a room, please use the booking page. Thank you. Hotel Café du Sud offers you different types of seasonal promotions. Stay connected to know about the latest packages and be the first to be up to date about our discounts. Stay a little longer with more days to enjoy the desert. 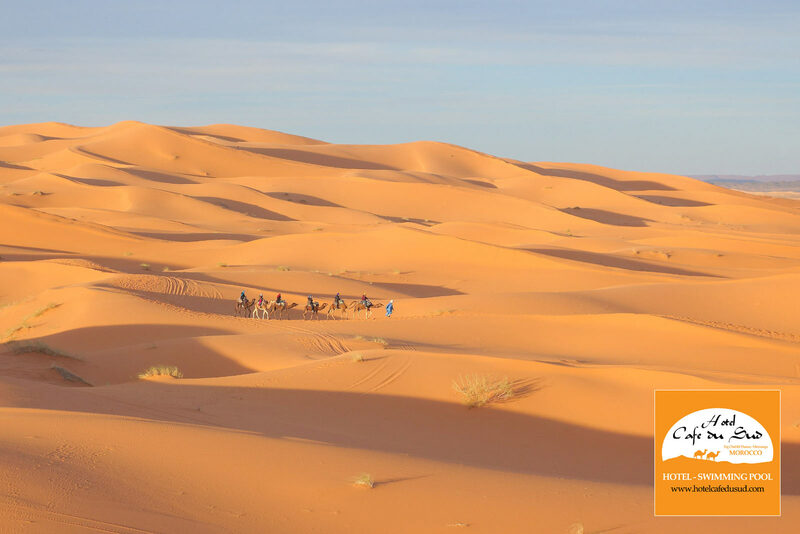 Our special promotion gives you the best guarantee rates for your accommodation in Merzouga dunes. With your savings on accommodation, indulge in more experiences immersing you in the best Moroccan destination. The discount does not apply to restaurant services, camel trekking, and desert tours. The price quoted is per room per night, including maximum discount, and is subject to seasonal variations, a cancellation policy, children policy and change without notice. In the case of early departure, the full period of stay will be charged. Offer cannot be used during the high season of “Semana Santa”, New Year’s, and in conjunction with any other offer or discount.